New analysis of lunar rocks suggests that Earth's Moon could be around 200 million years younger than previously thought. 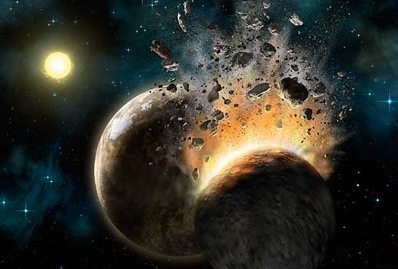 The leading theory of our Moon's formation is that it was born from a giant impact between a Mars-sized body and the early Earth; the debris from this cataclysmic collision coalesced to form the Moon. As the Moon cooled it solidified into different mineral components, from which relative ages can be deduced. The Moon formed in a giant impact event, but it could have happened several hundred million years later than previously thought. Image: Gemini Observatory/Lynette Cook. In the giant impact model, a rock type called ferroan anorthosite (FAN) represents the oldest suite of crustal rocks, but accurately dating its age by analysing the isotopes of the radioactive elements lead and neodymium has been hampered by the very low concentrations of the elements used in the technique, and the fact that most old rocks of the lunar crust have been affected by later impacts. Furthermore, FAN is predominantly made of one mineral, plagioclase feldspar, but most applicable dating methods require at least two compositionally distinct minerals. "We were lucky in finding a piece of sample 60025 that had an unusually large amount of the mineral pyroxene in addition to plagioclase," Richard Carlson of the Carnegie Institution for Science in Washington tells Astronomy Now. "We used conventional techniques that have been gradually improved over the 40 years since the lunar landings to improve on previous dating attempts and we worked on a split of the sample that was mineralogically amenable to this study." The refined analysis places the FAN's age at 4.36 billion years, significantly younger than the oldest estimated age of 4.568 billion years, equivalent to the age of the Solar System. The new, young age correlates with some of Earth's oldest minerals, suggesting that the oldest crusts on both Earth and Moon formed at approximately the same time, and that this time dates from shortly after the giant impact. "Thermal models show that a molten Moon would crystallize to the point of forming a crust similar in composition to the rock we dated within a few hundred to a few thousand years," says Carlson. "If the Moon's crust did not form in this manner, then it is possible to likely that the age of this rock does not correspond to the age of the Moon." The findings imply that either the Moon solidified a lot later than previous estimates, that the theory of lunar crust formation by a solidifying magma ocean is incorrect, or that the rocks studied do not represent the oldest type of lunar sample. Carlson is confident that the team's findings strengthen the idea of a giant impact theory for the Moon's formation, however. "Theoretical models of planet accumulation allow a few moderately large planetesimals to survive for long times (100's of million years), so a "late" giant impact is somewhat expected in part because the consequences of earlier big impacts will be overprinted by the last big impact. There is no other obvious mechanism to form a Moon this young." The research team was led by Lars E. Borg of the Lawrence Livermore National Laboratory and the work is published in the 18 August issue of the journal Nature.